Lawmakers can avoid the long lines plaguing California's Department of Motor Vehicles offices by visiting an office near the Capitol not open to the public, a decades-old practice under fresh fire as wait times surge. The office provides services for current and retired lawmakers, their staff and some other state employees, The Sacramento Bee reported Thursday. DMV spokesman Artemio Armenta said its primary purpose is to handle constituent requests that arrive on lawmakers' desks and that the two-member staff handles 10,000 requests per year. But one lawmaker said it shouldn't provide extra perks for the Capitol community as regular Californians are forced to wait up to hours in line for services at their local office. "I have gotten my registration and all that stuff the old-fashioned way like everybody else in my district," Republican Assemblyman Jim Patterson told the Bee. "When you are living a public life the way most private people live, you'll understand when taxes hurt and bureaucracies hurt." Patterson's colleagues rejected his request to audit the DMV on Wednesday, and lawmakers have recently approved more money for the agency to deal with its exploding wait times. 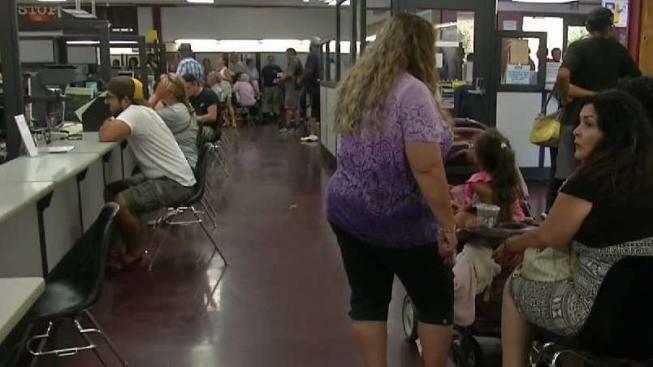 DMV officials said the long lines are due to complications complying with new federally mandated security upgrades for ID cards. In late 2020, airport security checkpoints will require so-called "Real ID" compliant cards, and Californians are now beginning to get the updated cards. Lawmakers have approved tens of millions of dollars to hire more staff and implement the roll-out of Real ID. The DMV recently announced it would open more than a dozen offices on Saturdays. Whether lawmakers and Capitol staff should get access to a private DMV has been disputed before. Some people who work in and around the Capitol downplayed the office's existence in response to the Bee article, saying it's been known about for years. A 2006 Capitol Weekly article highlighted the debate over the office, referencing a small-government activist who criticized it for years. The office has been open for decades, moving locations around the Capitol. At one point it was open to the public. Now, the office is unmarked at the end of a hallway in the Legislative Office Building, located across the street from the Capitol. When a reporter stopped by on Friday, the door was locked and a woman who answered directed all questions to the public affairs office. Armenta, the DMV spokesman, said the door is locked because the office handles cash transactions and holds people's personally identifiable information. About 90 percent of the office's work relates to requests from constituents who call their lawmakers over complicated problems the local DMV branch may not be able to solve, he said. "Often times it's a conduit for constituent work," Armenta said. "It provides the Legislature a way to be closely in contact with state government on helping customers with situations that they're having." Spokespeople for Assembly Speaker Anthony Rendon and Senate President Pro Tem Toni Atkins did not respond to questions about whether it's appropriate for lawmakers to get services at the office.